Liz Broscoe is a professional drummer/percussionist, author, adjunct faculty at Lake Tahoe Community College, teaching artist for schools and at-risk youth, and a corporate team building facilitator. Through her drumming programs, she continues to inspire others throughout the Tahoe/Truckee/Reno and Carson Valley areas. Learn more at www.drumchik.com or call Liz at: 530-318-2330. We drum because it’s fun! That is a given. There is something very rewarding about the sound, feel, effort and the unifying experience created within a community drum circle. 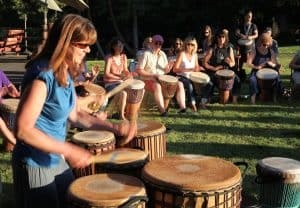 I am a long time professional drum set player, but this all-inclusive communal drumming I am referring to is very different than playing in a band focused more on entertainment. 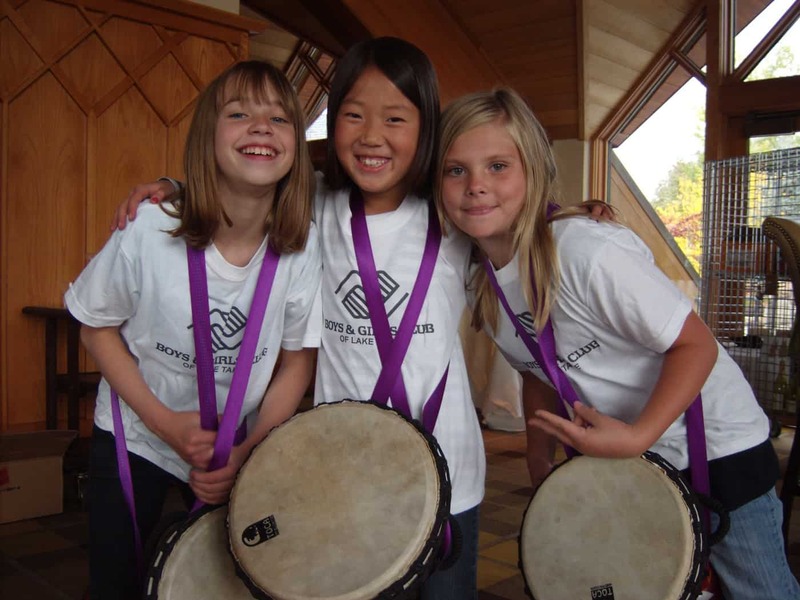 Current research shows that specialized group drumming provides many health, wellness and therapeutic benefits. Experiencing steady, rhythmic drumming improves cognitive brain function – increasing our ability to hold attention and focus. This is so good for kids and adults these days with all of our technology pulling our attention everywhere. Drumming increases cancer fighting white blood cells in the immune system, decreases stress, anxiety, blood pressure and pain. It is a “Whole Brain” activity that provides the rare experience of activating and balancing both sides of the brain simultaneously. Consequently, drumming can benefit people dealing with Cancer, Parkinson’s, stroke, PTSD and many other conditions. In her book, “When the Drummers Were Women”, Layne Redmond expressed that it is our primordial desire to get back to our roots of drumming. Archeological findings confirm that many cultures have drummed since ancient times. Drumming is fascinating to me. As a professional drummer of nearly four decades and an educator/facilitator for the last twenty years, I am continually inspired and motivated in helping my students gain a deeper understanding of themselves through drumming. From at-risk kids to adults, whether I facilitated in schools, juvenile treatment centers or at corporate team building events, I continue to enjoy the challenge and rewards of bringing folks together collectively and communally in mind, body and spirit through drumming. From a science point of view, our ancestors did not understand why they drummed, but they certainly knew intuitively. Yes, it’s super fun, but now we know it is also really good for us!! See the full schedule and book your Wellnesse Weekend getaway here. Learn more about Sierra Soul and book your wellness getaway today.